If you’re in the middle of quinceañera planning, you may be wondering if it’s a good idea to hire a choreographer. You or your daughter may be dreaming of a huge show-stopping dance number, and if this is the case, a choreographer may be necessary in order to whip everything into shape. Is There Room In Your Budget? A good choreographer typically costs $35-$60 an hour, and most quinceañeras choose to choreograph two routines. This usually averages out to about 20 hours of practice over the course of a few months, so this can be somewhere in the range of $700-$1200—although sometimes you can find deals as low as $500. If you have room in your budget and it’s something you or your daughter has their heart set on, a choreographer may be a good investment to make during the quinceañera planning to make sure her day goes the way she wants. Should All Dances Be Choreographed? 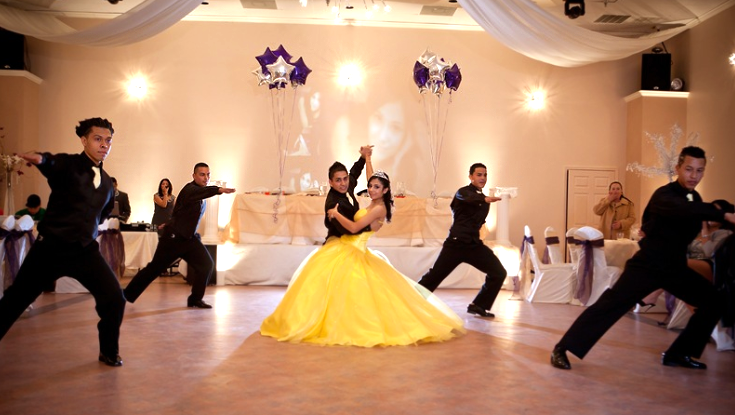 Quinceañeras typically include a father-daughter dance, a waltz, an exit waltz, and a baile sorpresa (surprise dance). Choreographers can be hired to choreograph all of these, or just the surprise dance. Dance styles can include anything from samba to swing to bachata to salsa. Some girls want a choreographer only for the surprise dance, and others want a choreographed father-daughter dance as well—which is often a big highlight of the celebration. Knowing exactly how many choreographed dances you want before speaking to a choreographer is a good idea. Who Will Be Handling The Dancers? Will any of the quinceañera’s chambelanes or damas need rides to the practice space? Who will be supervising to make sure everything goes smoothly and the money invested into the choreographer isn’t being wasted by teenagers who may not actually be trying to learn? Who will be there in case of an emergency? These are all important questions to have answers to when quinceañera planning. Is There Somewhere To Practice? This is obviously important. The average number of dancers is 15, and you can’t have a big group of teenagers trying to learn a dance in someone’s tiny living room or garage. The best practice space will have a similar floor to the party venue, but anywhere that fits everyone comfortably enough to dance will work. It’s just very smart to make sure there’s somewhere to do this before talking to a choreographer. Is It Realistic To Organize? Consider the schedules of everyone that will need to be involved, as well as their willingness, and confirm all the details with them before speaking with a choreographer. The average amount of time you’ll need to schedule beforehand is three months in advance. Most quinceañeras learn an average of four choreographies by practicing twice a week. This is why choreography scheduling is a big part of quinceañera planning. At Hollywood Banquet Hall, we love hosting quinceañera celebrations. Our amazing Los Angeles event venue is perfect for special occasions like these. If you’re also looking for a venue during your quinceañera planning, check out our photo gallery, or feel free to contact us for pricing and availability!